The latest and greatest iPad Pros were put forth into the world less than two weeks ago. Countless reviews followed with more yet to come, many taking pot-shots at the shortcomings of iOS. These are are fair criticisms as iOS has some ground to make up (which we will talk about later) but it isn't the whole story. Apple has been clear between the build-up to the iPad Pro over the summer. The latest announcements and marketing messaging for the iPad Pro reinforced that it is time for people to consider the iPad Pro a computer, and not just a content-consumption stab of metal and glass. That doesn't necessarily mean that the iPad Pro is meant to be a full computer replacement across the board, for every living soul, but it is meant to be a pro device nonetheless. We've already been over the raw specs and performance when we talked about the 11-inch iPad Pro. We aren't going to rehash a lot of ground here. 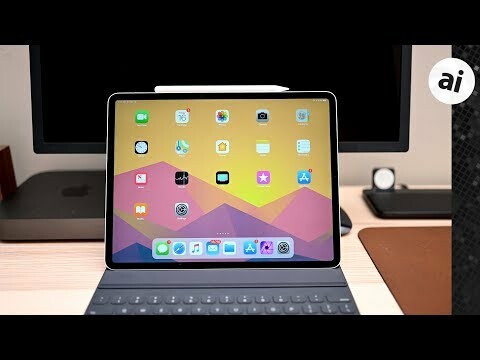 We took Apple at its word and started this review with the assumption that the iPad really is a "pro" device and threw the large 12.9-inch model into our own day-to-day workflows here at AppleInsider to see how it fared. And, we wanted to see if there is any functional difference between its predecessor, and the new 11-inch (review). Of course, there are different definitions of a what being a "pro" device entails, and what a "professional" does or needs, for that matter. "Pro" is first and foremost a marketing term, meaning nothing by itself, other than a higher-performing version of some other hardware. And, there are countless different verticals of "professionals" only some of which may find the iPad Pro suitable. In this circumstance, I'm framing the use of the iPad Pro within my own professional life. My workflow consistst of about 10,000 words a day of writing, photo sessions for review gear, video shoots for the same, and and frequent traveling. As one who deals with mass amounts of media, I should be a primary target for pro use. To date, I've been using the second generation 12.9-inch iPad Pro for the past year and was excited to see how the new Pro could build on that. I very much enjoy using my iPad and it finds its way into more areas of my professional, and work life. This isn't to say I don't enjoy my late-2016 15-inch MacBook Pro, it just often feels like bigger iron than I need for most of what I do. The macOS interface remains great after years of refinements and I do love the Dark Mode and Finder improvements brought on by macOS Mojave. But, when I examine both devices on what I actually enjoy using, I always come back to iPad. On specs alone, we were pretty excited about the new iPad Pros from the start. It was my personal opinion that the new design which is seemingly a mix of the original iPad's flat sides and the flat back of the more recent models feels a bit dated, holding and using it is a different matter entirely. The slimmed bezels put the display front and center and don't cause any spurious touch actions while holding or handling the iPad as we had worried about pre-release. This is also the first time Apple's authentication method has been entirely hidden on the device, letting it work in the background without the user giving it a second thought other than looking at the iPad. And, there is no notch to bicker about. Apple has dubbed the new display a Liquid Retina one, the same moniker bestowed upon the iPhone XR's glass. This is certainly the most advanced LCD Apple's ever put it out, packing away a few tricks still not seen on any iPhone. That Liquid Retina designation comes by way of the rounded corners, which does allow the bezels to be smaller and the display to mimic the curves of the body. This is a subtle effect but goes a long way in making the display feel more immersive. The downside though, is that because of the new aspect ratio, developers once more need to update their apps to rid them of the dreaded black bars that have manifested themselves a few times along the iOS lifespan. Many key players here have already submitted updates accordingly, but it could be a while before your entire catalog of apps adopts. On the 12.9-inch model, this isn't nearly as noticeable but our 11-inch-using brethren have stronger opinions on the matter as they have less real estate to give up. Tap to Wake also makes an appearance on iPad with the new Liquid Retina display, which is even more essential with the lack of a physical Home button. Of all the changes to the new iPad Pros, count this as one of our favorites. It is easy to wake the display to check the time or notifications while we are in the middle of a shoot than struggling to find the power button around the edge, and we're looking forward to when it migrates further down in the iPad line -- it should open up some interesting use-cases around the house. Face ID and the TrueDepth camera system makes us never want to go back to Touch ID. We did like Face ID on the iPhone, but it is somehow even more of a game changer on iPad. As we work in many native applications and web apps alike, we input credentials frequently. It was a jarring experience to our workflow in the past when we'd have to move our hands from the keyboard to authenticate with Touch ID. Face ID on the other hand just authenticates in the background, letting you keep moving and quickly putting in your credentials, be it from iCloud or apps like 1Password. In our office, we often have two people who have to work on the iPad during a shoot, checking images while someone else is behind the camera , perusing the shot list, or other similar tasks. Touch ID allows for input of five fingerprints for verification, but Face ID is limited to two. For us, this worked. It may not in a larger shared environment. We set up the Alternate Appearance and went on our way, but in larger shared environments, we can see more being relegated to the old six-digit passcode. Internally, iPad Pro is all about performance. It has serious gains in every category, outpacing many traditional PCs. Driven by the A12X processor, we've seen this iPad do some remarkable things. In our 11-inch iPad Pro review, which has the same internal specs as the 12.9-inch, we saw videos exported significantly faster than the last generation models, and we've obviously seen the same things with the larger sibling. No one really questions the raw power of the iPad Pro, it's obvious. Workflows vary, though, and it may be overkill for some. In my workflow, there were definite instances that power came in handy, but many more where it didn't matter. I deal with a lot of photo editing, usually going between the excellent Affinity Photo and Pixelmator. When we dump a massive RAW photo, throw on several effects and layers, and combine multiple photos, our last generation iPad Pro started to struggle. To be fair, we also saw our high end late-2016 MacBook Pro struggle so it isn't an easy task. The new 12.9-inch iPad Pro though, excelled. Load times still noticeable when in-painting a large area, but much less than the last. That gorgeous 12.9-inch display is just perfect for viewing, and editing photos. There are elements we wish we could utilize on the iPad, such as an external adjustment knob or even additional gestures on the Apple Pencil, but it still remains an excellent experience. It's a joy to lean back in a chair with the iPad, and pan around these massive photos to edit. At the same time, dealing with the files is another matter. For a lot of my work, I use cloud storage lockers such as Amazon Drive to backup and store files, as well as locally. It is easy enough to dump photos from my camera -- with no adapters over USB-C mind you -- when I'm eager to start editing, but dealing with massive amounts of files is still a task left to my Mac. The workflow usually involves duplicate photos in multiple locations, a daunting aspect no one particularly wants to deal with. This was also the case with the previous model, so the issue lies with iOS rather than the physical hardware of the iPad Pro. The iPad Pro hardware makes it easier, in theory, to deal with files in better ways thanks to the USB-C port. USB-C has been an amazing asset to the iPad Pro, letting us connect our aforementioned camera direct to the tablet, with the same cable used to charge either the iPad or the camera, to transfer photos and videos. This has a huge impact already, but we do want it to go further. We simply have too much media to handle and with Photoshop CC launching soon, Apple needs to find a better way to deal with it on the iPad. Requiring all photos and videos to be run through the Photos app is no longer acceptable in a professional workflow. A few personal photos are fine, and it remains fantastic to be able to import them right into iCloud. But, on a customer's shoot, I want to keep them separate and import them right into the Files app. And, we'd like to do this without reliance on FAT formatting or a DCIM folder. Multitasking is designed for this large display, making it easy to have AppleInsider.com and Bear open in split view, with slide over a quick way to access my Twitter feed or Mail. Doing all of those on the 11-inch iPad Pro is doable, but would be problematic with a smaller screen. That larger screen also came into play when using it as a second monitor for our MacBook. Using Luna Display, The 11-inch is too tight to be entirely useful, but the 12.9 fits just right. Smaller bezels also allowed us to keep the displays close together and take up less space on our desk. Of all the situations we utilized the iPad Pro for, writing and editing were by far the most common by man-hour. When writing, we tapped away on the updated Smart Keyboard Folio. We have quarrels with the new design overall -- check out our full review for those -- but it is still the best choice. It retains the same stiffened fabric keys that allow us to type as fast, and as accurately as we can on our Mac. This entire review was created using this iPad sans for the above video which was handled by Final Cut Pro X -- which is a bit of a problem for total migration given our workflow. I created an outline of points to cover and a draft of the video script. I put together a shot list and points to film and photograph. I then imported the photos to my iPad for editing and processing which involved going first into the Photos app, importing to Affinity Photo, then exporting with the correct size and name into the Files app, then writing the final draft of the review and working it into the AppleInsider publishing platform for publication. The entire process was easy and streamlined other than the hurdles relating to Photos -- and the video editing, of course. It's been a week and a half thus far and we certainly have opinions on the device, but going back to our fundamental question of is the iPad Pro a real pro device? -- we have to say yes for the hardware, with caveats for the limitations of iOS. When Apple launches iPhones in the Fall, they come at the same time as the release of that year's latest OS. This year's iPhone XS and iPhone XS Max launched near simultaneously with iOS 12 and Apple baked in plenty of goodies just for those new phones. With the iPad that isn't necessarily the case. Rather, iOS 12 launched two months ago, and when the new iPad Pros came out there were no software-specific features for the new tablets other than perhaps Animoji or Smart HDR. We will inevitably have to wait nearly an entire year for iOS 13 to be released before we start to see the full potential of this hardware. It is likely Apple could include solutions for many of our pain points in that release with better uses for USB-C or external displays. This all makes it difficult to fully judge the iPad Pro now because they run the same software as the previous generation, making the devices feel older than they are. Apple has designed the new iPad Pro for the future, that much is clear. But, today, it does make significant inroads into simplifying our professional workflow. No, it doesn't replace our computer, but at least right now, it isn't meant to. Professionals don't always have one machine. If we switched today to the iPad Pro and ditched our MacBook Pro, we'd still wind up with a Mac mini running in the background acting as a media server. Whether it is meant to replace a PC or not is a different question, but it doesn't mean that iOS and the iPad Pro can't fulfill the potential it already has. The iPad Pro has room to grow, and it undoubtedly will. This iPad Pro feels like the most polished iPad yet and was worth our upgrading but we will still be here patiently waiting for third-party apps to tap into that unbridled power and for Apple to finally focus on new features with iOS 13 rather than the polishing and performance focused iOS 12. Apple authorized resellers offer a variety of perks on 12.9-inch iPad Pro purchases, including no sales tax on orders shipped outside New York and New Jersey at Adorama, plus free shipping within the contiguous U.S. Shoppers can also take advantage of financing incentives with the Adorama Credit Card, such as no interest when paid in full within six months on iPad Pro orders over $500 -- or no interest when paid in full within 12 months on iPad Pros over $1,000. With the holidays fast approaching, having a little extra time to pay off the purchase can be beneficial. Those looking for an iPad Pro right away can also shop in-stock models at B&H Photo and Abt.com with no sales tax collected on orders shipped to most states. does snyone know if the new ipad pro 12.9 safe to use for people with pacemakers? is the older version safer? how about the pencils? thanks. I would ask a different question. Do you need an iPad to be April, and are you willing to pay that price? For me I need an iPad to do a limited number of things, and for that I am willing to pay only so much. At this price point. I’d rather buy a laptop which can fundamental do so much more. For the form factor of an iPad and for what I needed to do give me something in the $500 range with a keyboard. Or wait, I already have them. I bought an iPad Pro 9.7 inch lashed year 128 GB. For less then $550. Or a simple answer, by the products that fits the need for as little as you can. Spend the rest on your loved ones. I’ll put aside the small niche use of pro artwork/photo editing with the Apple Pencil (or simple point of sale registers). Also, any tablet/large smartphone can be used for basic note taking/form input in the field (such as in a doctor’s office). That doesn’t make it a professional computer device. * ~$1000 Laptops are commonly used by professionals which can completely do all their job computer tasks. The test is whether the 2018 iPad Pro could completely replace a laptop for typical professional work. In most situations I know of the 2018 iPad Pro falls short. - For instance in an office setting with multiple computers for basic word processing, email, video attachments, database programs. But to charge the 2018 iPad at the same time needs a dongle. If one gets a video (with sound) to review, you need a dongle to work with wired headphones+charging+video out. I haven’t heard if that’s possible with the 2018 iPad Pro yet. The 2018 iPad Pro needs more ports. Software: besides problems with file management, iOS needs multiple floating windows, including in the email app, for better work flow. - The 2018 iPad Pro falls short to replace a laptop in typical basic office work. ~$1000 Laptops are commonly used by professionals which can completely do all their job computer tasks. I'd argue that laptops (notebooks) are not really professional either unless your job specifically requires mobility. I only use my MBP when on the road. If I am in the office or at home I almost always prefer my iMac or Mac Pro primarily due to the poor ergonomics of both the notebook and the iPad. It is much better when your monitor is at a natural height for viewing without hunching over or tilting your head down putting strain on your neck. The question isn’t whether or not the iPad is a “pro” device...but whether or not iOS is a “pro” OS. The answer remains no. It’s getting better but it’s not there yet. Those are going to certainly vary by job, which is what I said right at the inset. In my previous job as a Digital Marketing Manager, I used the iPad just fine work. It is roughly the same price as a laptop, affords more portability, and a lot of software is cheaper. It can easily do word processing, email, video attachments, and databases (I used several apps to tap into web-apps for DBs, as well as MySQL and SQL DBs). Some companies use proprietary software or others that may not be represented on iPad, but that isn't the tablets fault. I also don't see the issue of one port. When connected to most USB-C monitors, the tablet charges at the same time, so a non-issue. Otherwise, it still lasts many hours before needing to be charged. It could powered up over lunch, or a cheap adapter can be picked up, a minimal expense for a workplace. Headphones can be Bluetooth which would nullify that issue as well. Most offices used shared document solutions such as cloud storage or private servers, which all can be accessed on iPad, again, not an issue. I know it won't fit in many offices yet, but many offices can easily use iPads as computer replacements. A laptop can be used as a desktop while connected to a larger monitor at natural height. That’s how I’ve used them in my company. There are many jobs where employees work in an office and also have meetings in the field. In my company if the worker had a laptop, they would unplug it from the monitor for use outside of the office. * A laptop is a professional computer device because it can do desktop office work and then be taken into the field as the job requires. This double use is cost effective. For typical professional work the iPad Pro can’t easily do basic desktop business tasks as I described. I always wondered on the denfintion of a professional. I used an old iPad to run my pos system, do stock take, receive texts for orders in the cafe, orders from the website. Before we open I do emails on it and any changes needed on our web site. I can add photos to the web site with my iPhone which connects to the iPad and it’s all done. It accepts excel worksheets from my accountants and is way quicker than my old windows machine in the office. It’s cheap, I can take it home at night to do accounts on line ( Xero ) . A lot of business I trade with use Xero for invoicing so I do my banking/payroll/Business to business payments with an iPad. I employed 8 people in a cafe / garden centre and online business. How professional do you have to be ? Or do we only count video / audio “professionals “? Whilst it’s not for every one, nothing ever is, it is a very capable personal computer. If it doesn’t suit you then look else where, don’t waste time complaining it doesn’t suit you. I have a Lotus car it’s crap for towing, so I bought a Range Rover, you know what ? It’s crap at track days, but luckily I can tow my Lotus to the track with the Range Rover! So so my advice to professionals is to go out look at everything and then buy what’s right for your work. Two side by side apps with another in slideover isn't enough? So the iPad Pro isn't fully "professional" for your workflow. That doesn't preclude other people finding it fully meeting their "professional" needs. A 100% secure OS is not a toy OS. There are millions of zombie computers with "pro" operating systems. I understand from your previous post that you edited photos in the field using the Apple Pencil. That is a niche use case which is perfect for the iPad Pro. Also realize, my main home computer is an iPad. My wife and I have used them for years. * As for the rest of this, I’d mention that if a certain software OS or hardware feature has existed for decades and continues to exist, then there is a reason for it. - With software ease of use, multiple floating windows continue to be an OS feature on the Mac and Windows. Even for email with multiple replies and opening attachments, I prefer to use my Mac over my iPad because of the multi floating windows feature. In a business, often the equipment for the employee is the cheapest available. So commonly there is an HDMI monitor and 3.5 mm earbuds. And that would come with a laptop or tower. Second, in pro computers ports have value. Why else would Apple put in the most ports in their professional level computers (up to 4 TB in the MBP) while one of their least capable products, the MacBook, has only one USB-C port (+headphone jack)? All of these arguments are ultimately going to boil down to use case. But there's really only one that transcends devices, and that's the ability to use a keyboard without lifting your hands up to touch the screen to navigate, or worse yet, pick up and put down a pencil to do it. The iPad fails when using it with an attached keyboard because there is no other quick way to navigate without taking your hands awkwardly off the keyboard (arrow keys limited functionality notwithstanding), in a manner that is hardly ergonomic or productive. Just came out of the Apple Store - had my iPhone 6S Plus battery replaced - and I did check the 2018 iPad Pros out. I’m definitely in technolust with them, much more so than the iPhone XS models. Stunningly beautiful hardware. Beautiful thinness. Amazing displays. Amazing performance. Everything that has been said about them has already been said. Would rather replace my 1 year old iPad Pro 10.5 with an 11 than replace my 3 year old 6S Plus with a XS or XS Max. If Apple uses this ID for the 2019 iPhone models, they would be amazing. Either I go through the rigors of finding a good buyer, lose money trading it in or I wait. I always wait as that means better accessories (leather case please) and improved software, which is surely to come in 12.2, 12.3 and 13.x, and I can waterfall the 10.5 down to the kiddios. The matte Pencil is nice to hold, pleasant to use. I do not like the magnetic charging connection it uses as it is something that is begging to be placed on incorrectly and something that is easily jarred loose. The tip has to point towards the power and volume buttons. People place them on the wrong way on the Apple Store units. I think I prefer the old way where a charging plug is on the end and it charges in about 2 to 3 minutes. Just don’t like it hanging off the device like that as its “resting” place. Didn’t bother to check out the Keyboard Folio. A nice leather case would be interesting for this hardware. Or perhaps, just a magnetically attached back cover, a base, that doesn’t cover the sides. I do not like the camera bump, not at all, but I do like the scanning capability and occasional back camera usage. I would back down to something like a 5 MP or 8 MP back came if it means no camera lens protrusion. Hence, why I find a pure back cover an intriguing idea. I wouldn’t get hung up on whether it is a Pro device or not. “Pro” isn’t short for professional in my book. It’s short for proficient. It’s for people who can maximize the use of the software and hardware to its fullest capabilities, and often require more than it delivers. There will be a large fraction of users who will want more performance than the A12X delivers. Jason Snell came up with a good headline for it: ”A computer, not a PC”. An iPad Pro, and by that I mean 10.5” and larger models, can replace many of the workflows that PCs are used for, just not all of them. For the vast majority of users, it will perform the same or better than a PC would. But we definitely need to be critical of Apple to implement functionality to do all of the arbitrary workflows that a computer can do. The current UI really doesn’t scale well to 13” displays. Just implement overlapping views and be done with it. The I/O (both Lightning and USBC) need to be improved to support as wide a set of devices as possible, ideally everything PC support. More tunnels need to be built between the app sandboxes. Shell access should be enabled. The virtual memory system should be turned on. This is a method of market research, I think Apple invented. Simply, in the ever-changing world of IT in human endeavors, what is best served by a tablet and what is best served by a laptop? It’s a moving target... X% T vs. X% L = 100%. How does AAPL discover the respective %? They offer competing form factor platforms. Whatever “X” is, they can push in that direction in about a single product cycle and make money either way. It’s uncharted landscapes and form factor evolution. They do it really well. Funny that when MS showed their Surface Table 2 (or whatever it was called) for drawing & editing use cases, Apple critics flipped out about how awesome it was and it being true innovation (barf). But now that we see a very likely better approach, the critics poopoo it by saying drawing & editing is a small niche. So which is it? Was it innovative only when MS released a product for artists? Multiple floating windows is a relic of the past. iOS is much modern in that regard. I use multiple windows on my MBP 15" however, all bound to different desktops so that I can swipe between them. Swipe is always faster than point and click with the mouse or trackpad. Even on Windows (I use it in old Mac style, i.e. with overlapping windows) almost every user works in full screen windows; people don't like overlapping windows. And the Metro UI totally dismissed overlapping windows. I see that you reduce your comparison to a few reasonable concerns but I'd suggest don't make the lack of floating windows one of those, it is not a dealbreaker. Larger displays may persist for a while because of the in-house legacy applications, intranets, database layouts and alike but eventually businesses will recognize that mobility may be more important than desktop comfort in much of the cases. The same is true for the ports because of legacy devices and cabling but printers have already declared their independence with wi-fi. Ports will become less important for some of the devices and for some others their importance will depend on the integration they provide, such as TB3/USB-C/DP. Again, I see a misunderstanding of what a computer really is, or what’s needed. no computer can do the full range of work. All computers can only do a certain portion of it. The question is how this is defined. Can you edit a 2 hour motion picture on a laptop? Well, not really. So does that mean it’s not a professional computer? No really. we can all select our range of tasks that need to be done, and see how well a device fits into that. If it fits for some, and not for others, then that’s pretty normal. but some people are being deliberately myopic about this. You are being deliberately myopic. Thousands of organizations, including those in government use iPads every day, for what one must call “professional work”. Because these are professionals using them. I would imagine that the millions of people doing their work on iPads would be more than annoyed if you called them unprofessional because that’s how they work. Because professional work is not what YOU define it to be. You are incorrect about how the Pencil needs to be placed. It doesn’t matter which way. It’s also very easy to,place it. To do so, you bring the Pencil close to the center of the top, facing either way, and the iPad graphs it, and you see the “Apple Pencil” window, which almost immediately shows the charge battery in green, meaning it’s charging, and the amount it’s charged. I’ve been using this since the 8th now, and it works very well. It’s also not that easy to dislodge the Pencil from its perch. I’m not saying that a decent blow won’t do it, but it stays there if you swipe it a bit.